1) Name – What is the name of the character? Does the name have any symbolic meaning? Does the name have a hidden meaning? Does the name have an esoteric meaning? Does the character have more than one name and is this significant? Does the character have a title? Does the title tie into the cultural context of the character? 2) Physical appearance – How does the character look like? Is the character beautiful, average or ugly? Does the character have a physical abnormality? 3) Personality – What sort of personality does the character have? Is the character logical or emotional? Is the character introverted or extroverted? Is the character friendly or unfriendly? Is the character reliable or unreliable? Does the character have a normal or abnormal personality? 4) Character’s role – What is the character’s role? Some of the most common roles are antagonist, antihero, archenemy, comic relief, deuteragonist, false protagonist, focal character, foil, furniture (often an attractive female that serves no other function than to draw viewers to a television show or movie due to her beauty. The function of character is decorative. ), mentor, protagonist, sidekick, stock character, skeptic, supporting character, tempter and tritagonist. 5) Character’s problems/challenges – What problems and/or challenges does the character face in the story? The hero may face a villain with seemingly unlimited resources. The lover may face a woman with a complicated heart. The protagonist of The Old Man and the Sea may just want to catch a fish but probably there is more to the story than that. 6) Major accomplishments – What goals and/or objectives does the character accomplish during the story and does the character accomplish these goals? Typical goals are saving the world, conquering the world, winning the heart of a damsel, saving a damsel, making money, gaining power, gaining acceptance, bringing justice to the world, thwarting justice and revenge, one of my favorites. 7) Cultural context – Is the narrative trying to teach a cultural lesson? 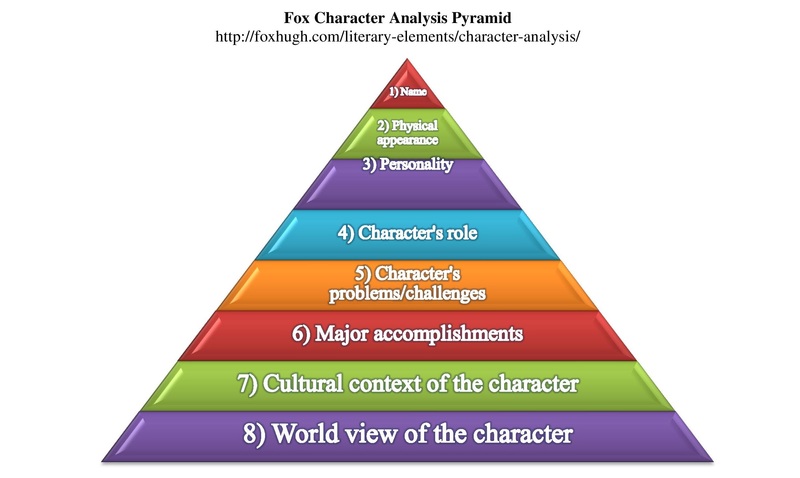 If so then the cultural characteristics of the character are probably extremely relevant and need to be analyzed. The most common relevant cultural characteristics include ethnic identity, gender roles, race, religion, and Socioeconomic status (SES). The same cultural characteristics of a character can interact within the larger culture in the story in very different ways. A story of an African American set in the Deep South when Jim Crow laws were operational will be very different than the story of an African American set in a contemporary inner city setting. The cultural characteristics of a character need to be seen within a larger cultural context for a deeper understanding of the character. 8) World view – The overall perspective from which one sees and interprets the world. In literary analysis, the way the character views the problem of evil is probably the most relevant aspect of the character’s world view. The antihero is often subscribes to nihilism as part of their world view. Some would argue science fiction (SF) comes with a built in SF world view. However, this supposed SF world view may affect plot more than characterization. The characters in a fantasy narrative often share a Dungeons and Dragons alignment world view that is difficult for newcomers to fantasy to understand. Wow, I teach ESL – ELA 6th grade and I am always looking for resourses and visuals to help and I will be trying this one this year! Thanks, let me know how it works out!